Are you a daredevil and definitely not afraid of heights? 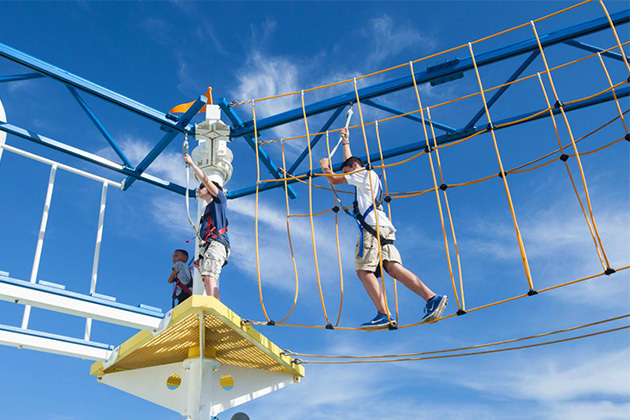 Then your happy place might just be dangling above a cruise ship, tightrope-walking your way across the SkyCourse ropes course on Carnival Cruise Line. 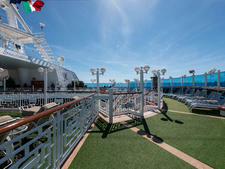 The SkyCourse ropes course is set up above the SportSquare on an outer deck at the top of each ship. The course makes a circle with two tracks, one easy and one hard. From experience, we can say that the easy course isn't necessarily all that easy! The ropes course is set up as a series of challenging traverses with round platforms in between so you can rest, wait for the person ahead of you to finish (two people can't be on the same rope bridge at one time) and plot your course. A section could be a swinging bridge, a narrow balance beam or a rope net to climb across. We found the most challenging sections to be the ones without good handgrips because you really had to focus on balancing. That said, once you're on the course, you can finish it quite quickly…unless you become paralyzed with fear and need to be talked through. You must be at least 48 inches tall to go on the SkyCourse, and everyone wears a harness with a safety rope. However, just because your child is tall enough to participate doesn't mean it will be easy for them. We saw a little girl get stuck on one of the platforms, and a SkyCourse staffer had to suit up and help her complete the course. One important tip is to make sure you wear sneakers. Sandals, flip-flops or flats will not give you enough support on the sections where you walk on ropes; plus, they're liable to fall off. 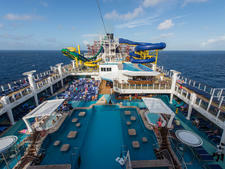 Small lockers are provided for your cruise card, cellphone and other personal items you have with you. You won't be allowed to take a SkyCourse selfie, so make sure you have a friend positioned to take your photo while you're tiptoeing on a tightrope. 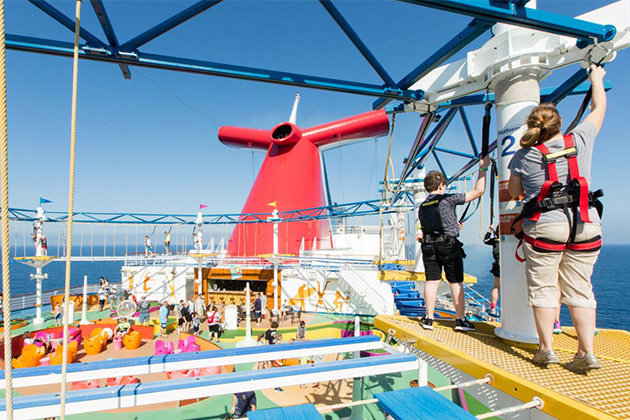 See photos of SkyCourse on Carnival Vista.